Lash and I got a call for a track at 10:30 Saturday night. I was able to start tracking a hour latter on this deer my hunter shot around 5:00 that night. The buck was gut shot but was quarting away when the arrow struck so we thought it could still hit some vitals. 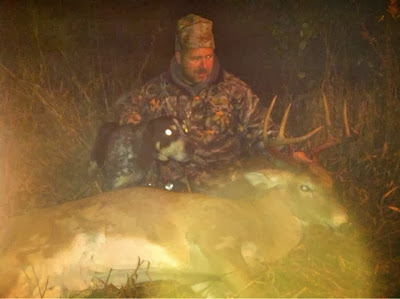 The deer ran into a strip of thick pine and the hunter was sure he ran north but there was 20 deer in the food plot when he shot, they waited 2 hours before tracking but came up empty handed and found little blood before it started raining, and that's when lash and I were called in. We started on the track and lash went a ways south then came back to the food plot, and this is where I should have know better . The hunter told me he waited there for at least 20 min and his deer didn't come back across the plot, boy was he ever wrong, so we spent a hour trying to cut the deers track going north or west some where in the pines for a hour with no luck, he said he could see the whole south and east edge of the pines, frustrated I asked the hunter again are you sure your buck didn't circle back and I could tell at that point he really wasn't as sure as the first time I asked him. I made one swing back down on the plot and wouldn't u know lash pulled me back where he was trying to go in the first place. We soon crossed the plot and lash took me rite down a run way with what do you know? Blood!! In less than 5 min we found the buck expired 300 yards from where he was shot. Just goes to show you the dogs are the professionals .We can all learn something new on every track and that why I enjoy tracking so much. Congrats on the beautiful Gladwin Co. 8 point! !